Tag Archive | "pinellas county florida"
Kevin P. Casey for The New York Times: Darlene and Robert Blendheim of Seattle are struggling to keep their home after their subprime lender went out of business. Judge Walt Logan had seen enough. As a county judge in Florida, he had 28 cases pending in which an entity called MERS wanted to foreclose on homeowners even though it had never lent them any money. Daniel Rosenbaum for The New York Times R. K. Arnold, MERS president, said the company helped reduce mortgage fraud and imposed order on the industry. Judge Logan had entered the murky realm of MERS. Although the average person has never heard of it, MERS — short for Mortgage Electronic Registration Systems — holds 60 million mortgages on American homes, through a legal maneuver that has saved banks more than $1 billion over the last decade but made life maddeningly difficult for some troubled homeowners. Created by lenders seeking to save millions of dollars on paperwork and public recording fees every time a loan changes hands, MERS is a confidential computer registry for trading mortgage loans. From an office in the Washington suburbs, it played an integral, if unsung, role in the proliferation of mortgage-backed securities that fueled the housing boom. But with the collapse of the housing market, the name of MERS has been popping up on foreclosure notices and on court dockets across the country, raising many questions about the way this controversial but legal process obscures the tortuous paths of mortgage ownership. If MERS began as a convenience, it has, in effect, become a corporate cloak: no matter how many times a mortgage is bundled, sliced up or resold, the public record often begins and ends with MERS. In the last few years, banks have initiated tens of thousands of foreclosures in the name of MERS — about 13,000 in the New York region alone since 2005 — confounding homeowners seeking relief directly from lenders and judges trying to help borrowers untangle loan ownership. What is more, the way MERS obscures loan ownership makes it difficult for communities to identify predatory lenders whose practices led to the high foreclosure rates that have blighted some neighborhoods. In Brooklyn, an elderly homeowner pursuing fraud claims had to go to court to learn the identity of the bank holding his mortgage note, which was concealed in the MERS system. In distressed neighborhoods of Atlanta, where MERS appeared as the most frequent filer of foreclosures, advocates wanting to engage lenders “face a challenge even finding someone with whom to begin the conversation,” according to a report by NeighborWorks America, a community development group. To a number of critics, MERS has served to cushion banks from the fallout of their reckless lending practices. A recent visitor to the MERS offices in Reston, Va., found the receptionist answering a telephone call from a befuddled borrower: “I’m sorry, ma’am, we can’t help you with your loan.” MERS officials say they frequently get such calls, and they offer a phone line and Web page where homeowners can look up the actual servicer of their mortgage. In an interview, the president of MERS, R. K. Arnold, said that his company had benefited not only banks, but also millions of borrowers who could not have obtained loans without the money-saving efficiencies it brought to the mortgage trade. He said that far from posing a hurdle for homeowners, MERS had helped reduce mortgage fraud and imposed order on a sprawling industry where, in the past, lenders might have gone out of business and left no contact information for borrowers seeking assistance. About 3,000 financial services firms pay annual fees for access to MERS, which has 44 employees and is owned by two dozen of the nation’s largest lenders, including Citigroup, JPMorgan Chase and Wells Fargo. It was the brainchild of the Mortgage Bankers Association, along with Fannie Mae, Freddie Mac and Ginnie Mae, the mortgage finance giants, who produced a white paper in 1993 on the need to modernize the trading of mortgages. At the time, the secondary market was gaining momentum, and Wall Street banks and institutional investors were making millions of dollars from the creative bundling and reselling of loans. But unlike common stocks, whose ownership has traditionally been hidden, mortgage-backed securities are based on loans whose details were long available in public land records kept by county clerks, who collect fees for each filing. The “tyranny of these forms,” the white paper said, was costing the industry $164 million a year. Although several courts have raised questions over the years about the secrecy afforded mortgage owners by MERS, the legality has ultimately been upheld. The issue has surfaced again because so many homeowners facing foreclosure are dealing with MERS. Advocates for borrowers complain that the system’s secrecy makes it impossible to seek help from the unidentified investors who own their loans. Avi Shenkar, whose company, the GMA Modification Corporation in North Miami Beach, Fla., helps homeowners renegotiate mortgages, said loan servicers frequently argued that “investor guidelines” prevented them from modifying loan terms. “But when you ask what those guidelines are, or who the investor is so you can talk to them directly, you can’t find out,” he said. MERS has considered making information about secondary ownership of mortgages available to borrowers, Mr. Arnold said, but he expressed doubts that it would be useful. Banks appoint a servicer to manage individual mortgages so “investors are not in the business of dealing with borrowers,” he said. “It seems like anything that bypasses the servicer is counterproductive,” he added. When foreclosures do occur, MERS becomes responsible for initiating them as the mortgage holder of record. But because MERS occupies that role in name only, the bank actually servicing the loan deputizes its employees to act for MERS and has its lawyers file foreclosures in the name of MERS. 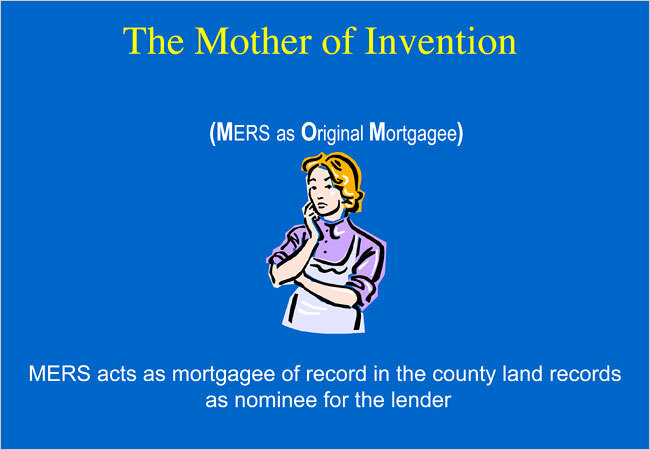 The potential for confusion is multiplied when the high-tech MERS system collides with the paper-driven foreclosure process. Banks using MERS to consummate mortgage trades with “electronic handshakes” must later prove their legal standing to foreclose. But without the chain of title that MERS removed from the public record, banks sometimes recreate paper assignments long after the fact or try to replace mortgage notes lost in the securitization process. This maneuvering has been attacked by judges, who say it reflects a cavalier attitude toward legal safeguards for property owners, and exploited by borrowers hoping to delay foreclosure. Judge Logan in Florida, among the first to raise questions about the role of MERS, stopped accepting MERS foreclosures in 2005 after his colloquy with the company lawyer. MERS appealed and won two years later, although it has asked banks not to foreclose in its name in Florida because of lingering concerns. In Seattle, Ms. McDonnell has raised similar questions about bankers with dual identities and sloppily prepared documents, helping to delay foreclosure on the home of Darlene and Robert Blendheim, whose subprime lender went out of business and left a confusing paper trail. The avalanche of foreclosures — three million last year, up 81 percent from 2007 — has also caused unforeseen problems for the people who run MERS, who take obvious pride in their unheralded role as a fulcrum of the American mortgage industry. In Delaware, MERS is facing a class-action lawsuit by homeowners who contend it should be held accountable for fraudulent fees charged by banks that foreclose in MERS’s name. Sometimes, banks have held title to foreclosed homes in the name of MERS, rather than their own. When local officials call and complain about vacant properties falling into disrepair, MERS tries to track down the lender for them, and has also created a registry to locate property managers responsible for foreclosed homes. THIS IS WORTH REPEATING OVER AND OVER!!!! RIGHT ON POINT ABOUT WHAT WE WERE JUST TALKING ABOUT IN HEARING YESTERDAY!! I appeared as expert witness in a case yesterday where the Judge had trouble getting off the idea that it was an accepted fact that the note was in default and that ANY of the participants in the securitization chain should be considered collectively “creditors” or a creditor. Despite the fact that the only witness was a person who admitted she had no knowledge except what was on the documents given to her, the Judge let them in as evidence. The witness was and is incompetent because she lacked personal knowledge and could not provide any foundation for any records or document. This is the predominant error of Judges today in most cases. Thus the prima facie case is considered “assumed” and the burden to prove a negative falls unfairly on the homeowner. The Judge, in a familiar refrain, had trouble with the idea of giving the homeowner a free house when the only issue before him was whether the motion to lift stay should be granted. Besides the fact that the effect of granting the motion to lift stay was the gift of a free house to ASC who admits in their promotional website that they have in interest nor involvement in the origination of the loans, and despite the obviously fabricated assignment a few days before the hearing which violated the terms of the securitization document cutoff date, the Judge seems to completely missed the point of the issue before him: whether there was a reason to believe that the movant lacked standing or that the foreclosure would prejudice the debtor or other creditors (since the house would become an important asset of the bankruptcy estate if it was unencumbered). If you carry over the arguments here, the motion for lift stay is the equivalent motion for summary judgment. This transcript, citing cases, shows that the prima facie burden of the Movant is even higher than beyond a reasonable doubt. It also shows that the way the movants are using business records violates all standards of hearsay evidence and due process. Read the transcript carefully. You might want to use it for a motion for rehearing or motion for reconsideration to get your arguments on record, clear up the issue of whether you objected on the basis of competence of the witness, and then take it up on appeal with a cleaned up record. My am news could never arrive too early from one of my favorite person. This judge unleashed a can of WHOOP ARSE! I think you will find this transcript very interesting. These highlights are from a Motion for Rehearing where the Court had granted summary judgment for the lender in a foreclosure case. The judge is Honorable Anthony Rondolino from Pinellas County, Florida. The hearing took place on April 7, 2010. 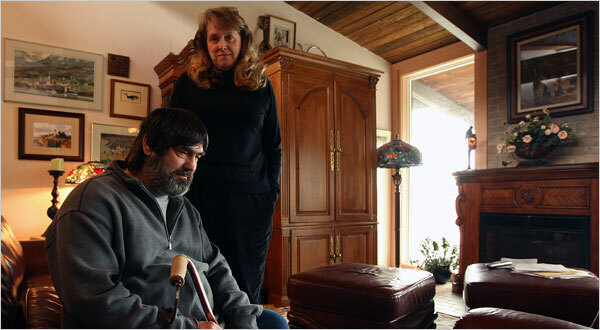 Counsel for the homeowner/defendant, Debbie Visicaro, was Michael Alex Wasylik. The judge reversed his own ruling that had granted summary judgment to GMAC Mortgage. The judge noted that in a recent foreclosure summary judgment hearing, there was a different plaintiff pursuing foreclosure on the same note and mortgage in a different county. “Interestingly, both affidavits, although they were different plaintiffs, purported the same facts and they were executed by the same individual in alleged capacity as a director of two separate corporations, one of which was ultimately found to be an assignee of the original note. Attorney for GMAC: Paragraph Two of our Affidavit says that based upon their personal knowledge, they’re authorized to make certain statements therein. 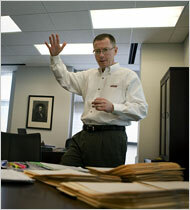 The attorney for GMAC was Steven Frasier from the Law Offices of David Stern.